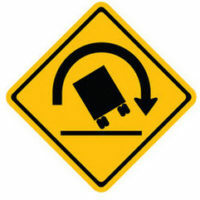 A 26-year-old truck driver from Callao, Virginia, faces criminal charges for reckless driving after overturning his tractor-trailer in Richmond County, according to an article by CBS affiliate WTVR. This truck accident occurred at approximately 6 a.m. on Monday, February 11th. At that point, the truck driver was heading east on History Land Highway, which is also referred to as Route 3. The truck driver was hauling nearly 10,000 pounds of liquid propane in cargo. Not far from Mulberry Road on Route 619, the truck driver lost control of his tractor-trailer. After trailing off of the road on the right shoulder, the truck driver tried to correct his trajectory. Unfortunately, the truck driver overcorrected, and the tractor-trailer flipped over. The vehicle ultimately came to a stop in the middle of the road, completely obstructing traffic. The Virginia State Police responded to the incident and began their initial investigation. Then clean-up crews worked to clear the tractor-trailer from the highway, a process which took several hours. At the time of the accident, the truck driver was wearing his seat belt. As a result, he escaped this incident with minor physical injuries. The truck driver did not require immediate medical attention from a hospital. Although the Virginia State Police continue to investigate this accident, the truck driver has already been charged with reckless driving and failure to maintain control. In light of this development, it feels appropriate to review how Virginia law classifies these two criminal offenses. Code of Virginia Section 46.2-852 outlines the definition of reckless driving. Under this section, reckless driving refers to careless and dangerous behavior on Virginia highways. If a driver operates their vehicle in such a way that creates a risk of property damage, physical injury, or death, it qualifies as reckless driving under Virginia law. The penalties for reckless driving appear in Code of Virginia Section 46.2-868. In most cases, this offense is classified as a Class 1 misdemeanor in Virginia. Upon conviction, the typical penalty includes 12 months in county jail and $2,500 in criminal fines, either or both. Code of Virginia Section 46.2-853 provides the definition of failure to maintain control. This offense is a specific form of reckless driving in Virginia. Specifically, Section 46.2-853 requires all drivers to maintain proper control of their vehicles while driving on any state highway. Additionally, this section prohibits drivers from operating a vehicle with faulty or improperly calibrated braking systems. Failure to maintain control is normally a Class 1 misdemeanor in Virginia. If convicted, the offender faces the same penalty scheme described in the previous section. If you have legal questions about reckless driving or failure to maintain control in Virginia, it is extremely beneficial to speak with an adept criminal defense attorney. The Virginia reckless driving attorneys at Simms Showers LLP, servicing Leesburg, Winchester, Fairfax, and Manassas, have many years of legal experience in the field of criminal defense, including reckless driving and failure to maintain control. If you need legal help with criminal defense, contact us today for a free initial consultation.